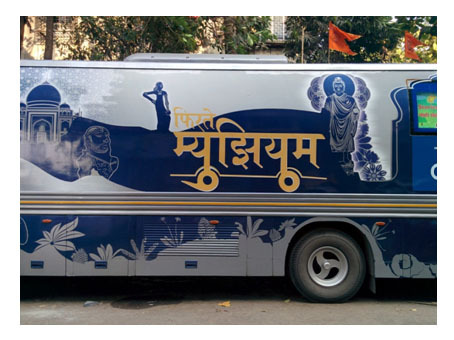 The Chhatrapati Shivaji Vastu Sangrahalaya (CSVS), is the first museum in Mumbai to introduce the concept of Museo-bus, a museum display-on-wheels, and started its journey in city’s suburbs. Museum director Sabyasachi Mukherjee said, “Many suburbanites have not seen the museum because they don’t want to travel on a holiday. We wanted to reach more people and, hence, decided to have a Museo-bus. It is a popular concept abroad. Municipal schools and private school students will no longer have to visit a museum to learn about the country’s rich heritage and culture. A museum on wheels will reach every school and will teach students through a display of artifacts, workshops, and demonstrations. 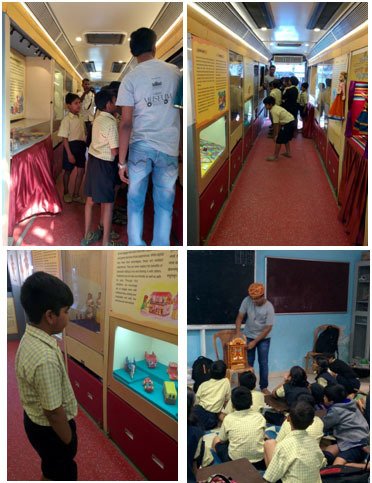 Started in 2015, the CSVMS Museum on wheels project is a bus with exhibitions on different themes that are changed every six months. The bus is equipped with display cases for objects, interactive demo kits, art supplies, audiovisual equipment and digital media such as touch screens and digital tablets. The museum on wheels bus has arrived at our school on 17th January morning at 9:00. The theme of the bus was handmade wooden toys from different Indian states. The displayed toys depicted the state’s culture. Kids started visiting the bus slowly one after the other class; the classes which are dome be visiting the bus had a small puppet show in the classroom. The presenter spoke about the wooden toys and their origin and how with time they lost their value. All the kids enjoyed the visit and the primary kids had some gala time with the presenter as he did a puppet show for them and explained them about puppets.